London has over 1,500 coffee shops, almost a third of the national total. With this number set to increase over the next few years, we’ve curated a list of our favourite coffee shops in the bonafide home of independent coffee: East London. Whether you enjoy regular or decaf, sweetened or original, cow or plant milk… there’s a coffee shop for everyone. This is by no means an exhaustive list; we’d love to hear any other suggestions you might have, so tweet us your favourties! Climpson & Sons have been roasting their own coffee in London Fields since 2002. After the roaring success of their Broadway Market coffee stall, they moved into a disused butchers shop in Broadway Market, and have gone from strength to strength since. All of their coffee is chosen not only for its taste but also its sustainability; the team from Climpson are keen to make sure that a relationship is built with the coffee growers in Myanmar (their main choice for coffee beans) and this relationship is fostered and nurtured to last for years. 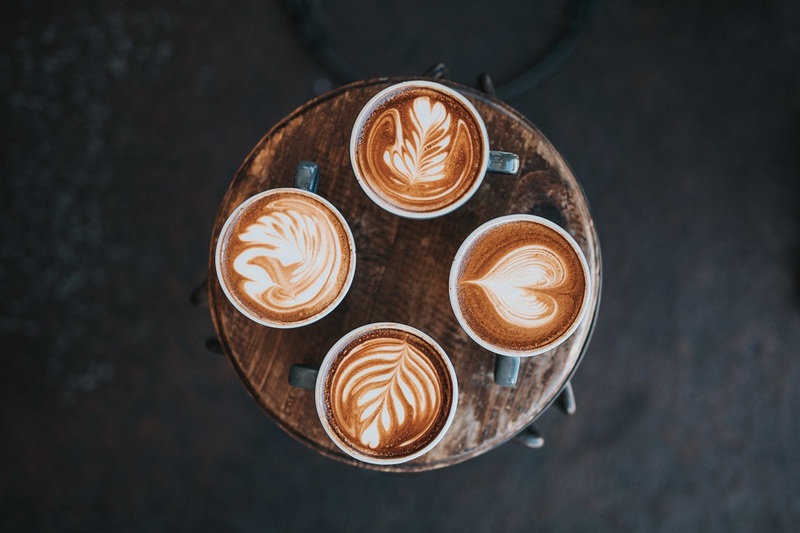 Alongside delicious coffees, they offer coffee workshops that are great for birthdays and group events, where they teach you everything you could possibly want to know about artisan coffee. Their coffee is also available as a wholesale opportunity which means you might already have tried their delicious blends elsewhere, for example in their devilishly moreish espresso martini. Look out for them at their original store in Broadway, as well as at Spitalfields Market and their Saturday coffee cart on Broadway Market. Staying open for up to 18 hours a day, this Shoreditch staple is a must for any serious coffee lover. What was once just an independent coffee shop has now become a fully licensed bar, restaurant and recording studio, and with branches in Soho, Whitechapel and the Royal Exchange it’s slowly taking over the London coffee scene. As well as classic coffee, Grind offer chai, beetroot, matcha and turmeric lattes, a range of teas and freshly pressed juices and a delicious brunch menu. Healthy options include Açaí bowls, granola and chia bowls alongside a full English breakfast, breakfast burritos and sweet potato harissa cakes. They also offer naughty-but-nice burgers from midday and buttermilk chicken. Expect to queue at this popular hotspot as they don’t take reservations, but rest assured it’s worth the wait. Australian siblings Nick, Laura and Andrew Trolley first set up Taylor Street Baristas in 2006 when they realised that there was nowhere in London that was on top of the coffee scene like coffee shops in Australia were. They wanted to give everyone the chance to experience the joys of high quality coffee. Their unique selling point is that they put the barista at the heart of everything they do, and they truly believe it is the barista that is the only thing getting in between you and a great cup of coffee. For that reason you can expect their baristas to be exceptionally qualified; they consistently partake in training to make sure that you get an exceptional cup of coffee every time. Taylor Street have their very own barista academy, with over 1,000 baristas being trained and even competing and winning coffee making competitions across the world. They select their beans from over 30 different locations across the globe and roast them at their own roastery in Deptford, and now supply boutique cafes and hotels with their own blends. Few coffee shops can match Taylor Street in terms of speciality coffee. Find them in Canary Wharf, Shoreditch, New Street, Monument, Bank, St Pauls and Chancery Lane, as well as at a cafe in New York and several independent coffee shops and hotels that use their coffee beans. A couple from New Zealand founded this cool and relaxed coffee shop. Located near the infamous Old Street roundabout, every seat is often full even out of rush hour weekdays as regulars flock to try their somewhat unusual spins on classic brunch dishes, and delicious coffee roasted onsite in their basement roastery. Whilst you might have to queue, it’s worth the wait to sample their kedgeree, winter porridge, Wagyu mince on foccaccia and slightly more traditional pancakes and french toast (expect a unique flavour though). Open until 10pm Monday-Friday, it’s the perfect spot to pop in after work and enjoy a cocktail or glass of wine with a quirky main meal. Definitely worth a visit for those who like their coffee with a twist. You might recognise this incredibly Instagrammable Hackney coffee shop from their 2017 ‘glitter latte’. This pink, palm tree adorned café is the perfect addition for trendy East London and whilst it might feel as though it’s all style and no substance, their pink-themed treats and multicoloured lattes are truly delicious. Flavouring and colouring their creations with all natural blue algae, beetroot and turmeric, and with all of their food vegetarian and vegan, you can feel somewhat saintly popping into this lush haven. The interior is very 1970s Miami, in a good way of course; lots of hanging plants and succulents are draped across the ceiling, with palm tree and pink wallpaper and cushions. For the truly devoted they even sell their own merchandise. Their pastel-perfect cakes can be enjoyed by the slice or you can pre-order and take them away – topped with a witty comment or slogan. Charge your phone and get ready to be immersed in a whole new coffee culture. Tom Sobey, the founder of this Shoreditch favourite, is surprisingly from Cornwall. More famous for its pasties and ice cream than coffee, Tom watched his parents run a successful Cornish coffee shop before embarking on his own coffee quest around Australia to work as a barista. Inspired by the advanced coffee culture that Sydney was already displaying, he returned and decided to buy a second-hand roasting machine, and just like that Origin was born. Fast forward several years and Origin have a much more advanced system with shops in their original home of Cornwall and also in Shoreditch, the British Museum, Hammersmith and Southwark. Cutting out the middle-man, Tom and his team visit all of their coffee suppliers to ensure that the beans they are buying are not only ethically produced but also sustainable, something that has remained at the heart of the business since the beginning. Delectable brunch dishes are also on the menu, with treats such as cinnamon, sumac and date granola, golden kimchi and eggs, miso oyster mushrooms and chipotle black beans and cornbread. By selecting the highest Arabica coffee beans, Allpress offer a delicious and unique flavour in every single cup. They started life in the Antipodean coffee capital New Zealand in 1989, before branching out to Australia, Japan and several islands in between before coming across to the UK, where they have built a substantial following. Find them on one of London’s coolest corners on Redchurch Street, where you’ll often find people enjoying a late-night caffeine hit right up until closing time. Head chef Tony Papas serves gourmet sandwiches, breakfast and brunch, pastries and an almost canteen-style lunch. With a welcoming atmosphere you can easily spend the best part of a morning or afternoon here. Do you have an unusual or quirky coffee shop, to recommend? Let us know!